Summer in Italian cooking calls for lighter dishes, but that doesn’t mean you have to skimp on taste. Everyone recognizes the original basil pesto recipe from Genova, which is classic and delicious. This month, however, I wanted to travel south to Sicily to make a Sicilian Pesto that has all of the colors and flavors of the sun-drenched island: tomatoes that have been lovingly dried in the sun, fresh basil leaves, toasted pine nuts, a touch of creaminess with some ricotta, and the salty bite of Parmigiano-Reggiano. I mixed it with Trofie pasta from Liguria, which is a short, thin, twisted pasta, to blend the north and south of Italy in one delicious dish. Since the topping is raw, it is quick to prepare, and is perfect served warm or cold. Take it to the beach and serve it at room temperature! 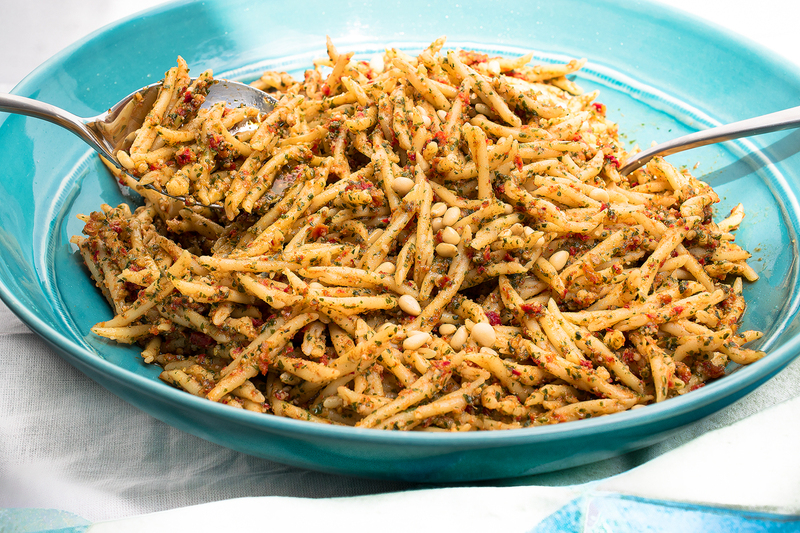 You can use any shape of pasta that you like, but make sure you add this flavorful pesto to your summer recipe repertoire and savor all the tastes of Italy in one dish. In a food processor add the drained sun-dried tomatoes and basil and pulse 4 or 5 times. Add the garlic, ricotta, pinenuts, salt and pepper and pulse 3 more times. Add the olive oil and run the food processor on high until you get a creamy texture. Add the Parmigiano-Reggiano, reserving 2 tablespoons for topping, and pulse 2 times to incorporate. Set aside. In a large pot of generously salted boiling water, add the trofie and cook for 8 minutes or until al dente, drain, transfer to a large bowl and lightly drizzle with olive oil to prevent sticking. Add the pesto mixture and 2 tablespoons of Parmigiano-Reggiano, toss to coat all of the pasta. Serve this versatile dish warm, room temperature or cold. This entry was posted on May 18, 2015 by Terlato Media. It was filed under COOK LIKE AN ITALIAN, Francesco Romano and was tagged with authentic italian recipes. Made it and it was a success! Thank you Coco de Mama and thank you Mazzoni for sharing such wonderful blogs! Oh, WOW, I’ve never had this and it looks amazing! My husbands going to go nuts. Seriously. So delicious – and easy to make, too! Enjoy, Connie! Hi Mel, you can find trofie in specialty stores and in some groceries across the country, but farfalle or fusilli would be great substitutes if you can’t find trofie. Buon Appetito!